Spectran HF-6065 V4 (HF6065 V4) : Satisfied customers throughout the world have discovered that field RF measurement doesn't have to be expensive with the Spectran series of RF Analyzers. Spectran Analyzers offer comparable and sometimes greater, functionality, features and specifications of units costing three times as much. 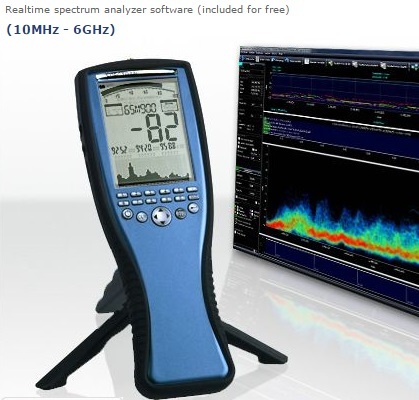 Spectran RF Spectrum Analyzers are sold in complete ready-to-go systems that include the RF analyzer, both Omni & LOG Periodic antennas, PC software, USB cable, power adapter / charger, mini-tripod, and carrying case, plus a phenomenal manufacturer-offered 10 year warranty. Kaltman Creations has pre-configured the analyzers' 10 Hot Keys to address the more popular North America RF bands: Wi-Fi, Industrial Remotes, Wireless Microphone, Business & Emergency Two-Way, Assisted Listening, Telco / Cellular, Intercom, and Radio / TV Broadcast. The user can also reprogram the Hot Keys as he sees fit.